The blend of goat + synthetic hair makes this brush ideal for buffing in liquid/cream foundation. It’s extremely dense, and for that reason it felt almost a bit ‘stiff’ to the touch – at least at first. But don’t get me wrong – it is as soft as it is dense, and a pleasure to use. Because I am a huge fan of organic compact foundations, I used this brush with a powder and it still worked beautifully: my base didn’t look like make-up, it just looked like my skin => wonderful results. Base One: in cup, lying flat across the Sculpt Three fan brush. From left to right in the cup: Face Two, Base One, and Sculpt Three. This brush surprised me a bit. It’s slightly smaller than other blush brushes I own, so I wasn’t sure how it would work. I’d say it is of average density – so, with a very pigmented blusher, you still have to be careful: you can over-apply fairly easily with this brush. However, in terms of its movement & how the fibres flex around your cheeks, it is stunning. When you hold it, it somehow encourages circular movements around the cheekbones on its own. The result is a very good compromise between beautiful blending (from the circular motion) and precise colour placement (due to the smaller brush head). In the cup: Base one (on the left), and Face Two (on the right). In the cup: the Sculpt Three fan brush lying across the larger Sculpt One fan brush. Same two brushes sideways: notice the lovely thickness of both fans. Now this, for me, is the fan brush to end all fan brushes. It’s made me a true convert, and since I got it, I’ve used it every day I’ve worn make-up. It’s fairly dense and thick, but also very soft, and with a fair bit of give. I tend to start my contouring with a very small and precise contour brush, dipped in a cool-toned contour powder. Afterwards, I warm up the edges of the contour with bronzer using Sonia’s Sculpt One. The results are stunning…! Not to mention it fits amazingly well around the forehead and temples, should you wish to extend the bronzer in those areas too. This is perhaps my fav brush from the whole set! Left to right: Worker One, Crease One, Pencil One, and Builder One. Left to right: Builder One, Worker One, Crease One and Pencil One. This is a very small and precise pencil brush. It’s soft but also a little springy – and for me, it works very nicely for colouring / smudging the lower lashline. If the brushes were sold individually, I don’t think I’d rush out to buy this one simply because I have similar Japanese pencil brushes, which are also very good. That said, I do enjoy using it! I find this crease brush to be very special in how sharp and precise it is, and also how springy it is. It’s not scratchy at all, and it’s interesting how it flexes on the skin so that the very tip of the brush trails behind the wider bulk of the hair. I’d start my blending with a softer tone and a somewhat bushier brush first, and then go in with this one to darken the crease or outer V further. It’s really great for that, and very enjoyable to work with. Top to bottom: Worker One, Crease One, Pencil One, and Builder One. This is one unusual little brush. If you turn the Builder One sideways, the shape is very sharp and triangular, since the base is considerably thicker than the tip. Yet if you turn it to face you, it appears flat. I’ve used this to pack on pigment for full intensity – especially with dark colours for a smokey eye. It works beautifully because it’s so small and grabs pigment so well. I’m planning on trying it soon with glitter too, which it should also deal with successfully, I bet. From left to right: Crease One, Pencil One, Builder One, and Worker One. Yet another very interesting shape in the collection. The Worker One is a chubby brush, which is only very slightly pinched. The result is an oval-shaped brush that can work for applying a wash of colour over the eyelid, simultaneously blending it away. Super useful especially if you want to do a simple eye look, and maybe pair that with a bold lip etc. If not, you can always use it to soften up edges in any eye look – it works for that too! 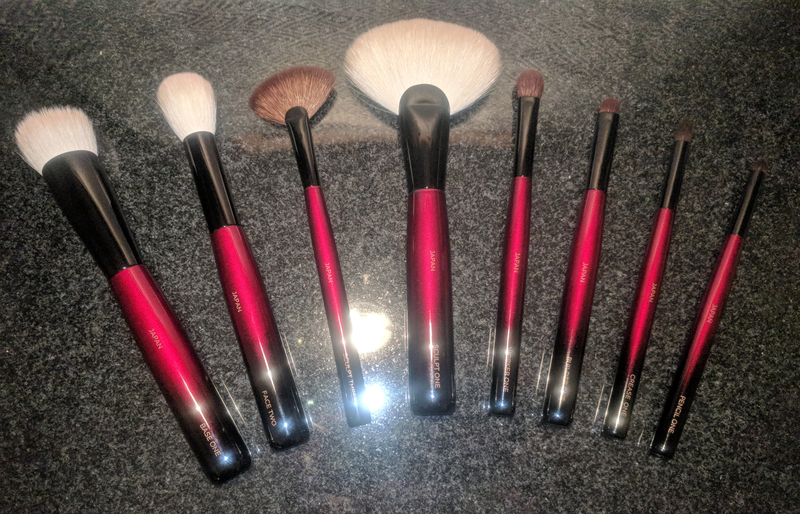 Stunning brush set, with amazing attention to detail. I thought it was a little strange at first – given the two fan brushes, and the absence of a typical / obvious blending brush. But you know what? The set just works… And it works amazingly well, too. You absolutely can pull off a full look without needing to resort to extra brushes (with perhaps the exception of a concealer brush – although I tend to use my fingers for that anyway). I haven’t heard of these brushes yet but they look really nice! Great post! From one passionate soul to another: many thanks for your support and for this amazing review! I wish you a very happy and healthy New Year and lots of fun with all things beauty as well as your blog!